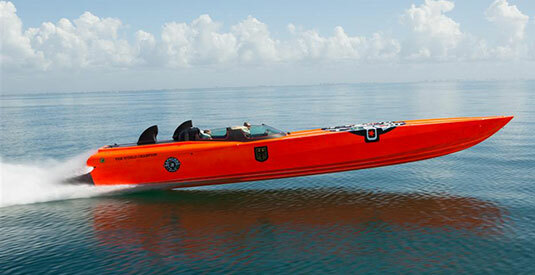 The APACHE STAR is the most famous Deep-V offshore Kevlar and carbon fiber race boat in history. Originally named APACHE HERITAGE, the boat broke multiple records and won world championships in 1992 and 1993 while writing powerboat history as the first sit-down Deep-V in the world. Following more than 7,000 hours of painstaking work to refurbish the boat to as-new condition, The APACHE STAR once again wears it’s famed Number 50 in anticipation of it’s new world record attempt. Modern upgrades to the boat include new custom-made helmets and Recaro racing bucket seats that utilize technologies developed for next-generation fighter jets, plus twin Mercury Racing bi-turbo engines that generate a combined total of 2,700 horsepower. In initial test drives, The APACHE STAR has achieved speeds in excess of 115 knots, and even faster speeds may be seen when it attempts to set the world record for the fastest crossing between Key West, Florida, and Havana, Cuba on August 1, 2015. A lifelong boater, Roger Kluh grew up with boats In the family. In the course of his 15-year career as a star ice hocky player In the German Elite League, Roger enjoyed numerous summer vacations in the South of France, where he developed a growing interest in offshore performance boats. 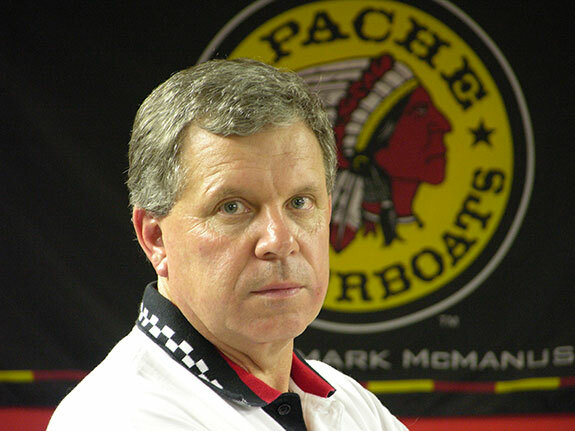 John Pompi, founder of Marine Performance Inc., has amassed more than 30 years of experience in the mechanical rigging of performance powerboats.He started his remarkable career at the age of 15, working in North Miami with powerboat legends Don Aronow and Mark McManus. 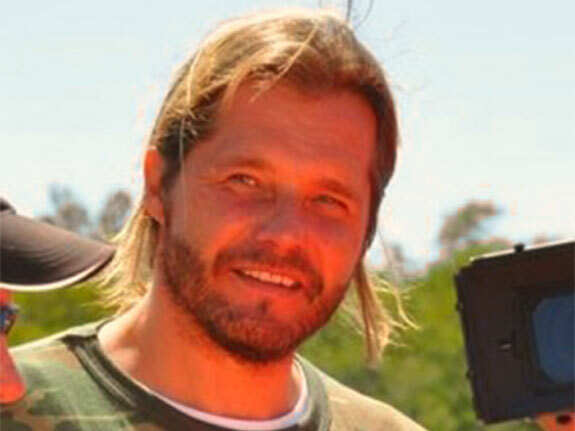 Damien Sauvage has captained a wide variety of speed boats and motor yachts to destinations all around the globe.Based in St. Tropez, France, Damien captained a number of luxury yachts for an elite cadre of private owners, overseeing all aspects of vessel operation while visiting ports of call worldwide. Approximately 200 Nautical Miles will be traversed over the course of 3 days, beginning in Key West Florida on August 1st. This first leg of the World Record breaking trip will take approximately 2 hours. Beating the previous record by over 4 hours! The return record breaking voyage begins on August 3rd, from Havana Cuba to Key West Florida. Apache 45’ – Deep Vee manufactured by Mark McManus. Apache Heritage is the most valuable deep vee powerboat in the last 25 years of powerboat racing. A sale for the boat has never been advertised or promoted. There are less than 25 total hours of use on the hull. It has never been damaged or repaired and has usually been in the control of Mark McManus. The initial cost in 1992 was $1.25 million Euros to provide Apache Heritage. The cost to replace Apache Heritage today is in excess of $3 Million. The success of Apache Heritage in 1992 and 1993 changed the future of the sport of offshore racing. The Apache 45 prototype is the only sit down Apache race boat ever produced. 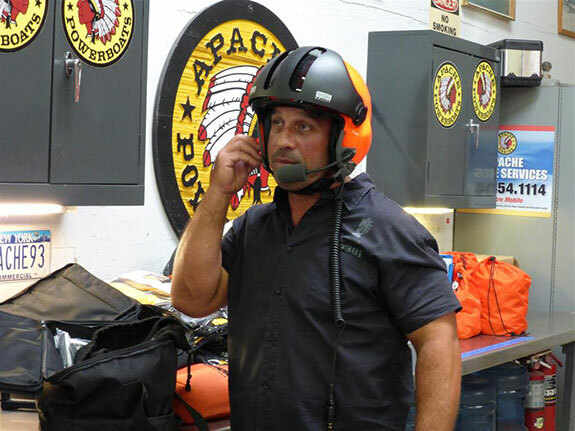 Apache Heritage proved that sitting under a canopy could be accomplished without problems for visibility and it added 10% to top speeds, in a safe cell for driver and crew. The design was successful winning two consecutive Super Boat Championships. Many manufacturers copied the design after production but no one has the laminate formulation or aware of how the hull was manufactured and the history of Apache Heritage has never been duplicated. Apache Heritage was the first deep vee sit down under canopy super boat with three (3) engines in the world. It was a prototype that changed the sport of offshore for increased safety,speed and endurance. History will be made in Florida on Saturday, August 1, when the most famous offshore Deep-V race boat in US history will attempt to set a new world record for the fastest crossing between Key West and Havana. The Apache Star – a two-time World Champion, Kevlar and carbon fiber Deep-V race boat capable of speeds in excess of 100 mph – will attempt to beat the current record with Apache Powerboats owner and offshore performance boating legend Mark McManus operating the throttles, and racer Roger Kluh driving. The crossing will mark the first time since 1963 that an American-built pleasure boat with an American crew has been authorized by the US government to visit Cuba. Apache Star will depart Stock Island Marina in Key West, Florida, at 10:00 am on Saturday, August 1, destined for the Castillo De Los Tres Reyes Del Morro then on to the Hemingway International Yacht Club, Havana, Cuba. The boat will return to Key West on August 3. The current record for the fastest Florida-to-Cuba crossing was set in 1958 by Forest Johnson, with a time of six hours, 24 minutes. This beat the original record, set in 1922 by Gar Wood. The Apache Star – originally named Apache Heritage – broke multiple records and won two world championships in 1992 and 1993, writing powerboat history as the first sit-down Deep-V in the world. Once again wearing its famed number 50, the boat has received a number of modern upgrades as part of an extensive restoration effort in preparation for its record attempt – including new, custom-made helmets and Recaro racing bucket seats that utilize technologies developed for fighter jets. Twin Mercury Racing bi-turbo engines that generate a combined total of 2,700 horsepower have pushed Apache Star to speeds of more than 115 knots in initial test drives. It took more than two years to prepare the vessel for this historic mission, and more than three years to secure the necessary permits. Apache Star will make history on Saturday August 1 – and perhaps set an all-new world speed record in the process. “APACHE STAR” arrived in Cuba in 90 minutes, crossing 110 miles with 3-9 foot seas!